Over time, leaking flat roofs can lead to major issues. And big bills. But now, we may just have the solution. There’s a brand new electronic detection system on the market that could stem the leak and save you cash, the Lummen flat roof leak detection system. A leaking flat roof can often go years before being detected and by the time you do notice, the rot has already set in. The damage can extend right down to the very foundations of the building and lead to extensive work, not to mention a new flat roof. With so many businesses and homeowners opting for flat roofs for their easy maintenance and low cost roofing, detecting leaks is the number one priority for people in charge in properties. 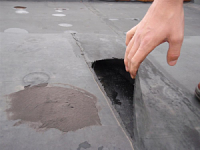 As one of the leading roof repairs firms in the UK, G&A Roofing is often called out to replace leaking flat roofs or plug leaks with temporary repair work. We always advise our customers on the best way to keep your flat roof leak-free and we’re excited to be working with the developers of this money-saving state-of-the-art leak detection kit. The Lummen flat roof leak detection system was devised by E.LU-Mess GmbH. It uses the latest technology to accurately detect leaks in your roof and give you the exact location. This safe and trusted solution to leaks is suitable for all flat roof types, including green roofs and gravel topped roofing. This fantastic device works by transmitting electron pulses across the roof top surface. But don’t worry, because it’s earthed. The earthed electron current is attracted by the leak and a high-tech digital receiver detects the drop in current so you can locate and fix the leak in no time at all. To complement the flat roof leak detection system, technicians at E.LU-Mess GmbH have also developed a flue gas system. The FDO 4.4 Monitoring System is a proven system that even works well alongside metallic components such as lightning conductors and ventilation ducts. These systems are the brainchild of Ewald Lummen, a developer and manufacturer in flat roof leak detection since 1996. This leak location technology is sought after across Germany and the EU. The Lummen flat roof detection system is now on offer to UK customers. You can now purchase the all-inclusive leak detection system for just £££s. Included in this offer is the flat roof detection case, drain verification set, and flue gas analysis system. To see some YouTube videos showing the flat roof leak detection equipment in use go to the E.LU-Mess GmbH Our YouTube video channel link. The introductory video is in English, the others are in German but you can clearly see how it all works. They will all have English makeovers soon. If you have any questions please phone Norman Ellis (Co-ordinator for sales to English speaking countries) on 0049 5241 904684 which is a German landline number or leave a message for a call back. Alternatively, send a contact e-mail to Norman.Ellis@t-online.de.